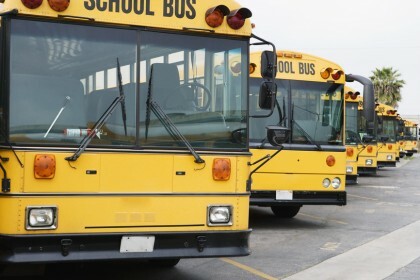 As kids and families prepare to go back to school, here are some important school bus safety tips for kids & drivers, a Portland accident & injury lawyer explains. Fall is here, and for many families, that means sending kids back to school. For parents whose children who will be riding school buses to get to and from school, going over some fundamental school bus safety tips can be essential to ensuring children know how to protect themselves and stay safe. It’s also a good idea for adult motorists to review bus safety tips in order to avoid potential bus and pedestrian accidents. To this end, below are some important school bus safety tips for kids and drivers. If you or someone you love has been hurt in a bus or traffic accident – and getting help with your financial recovery is your top concern right now, don’t hesitate to contact a Portland accident & injury lawyer at the Savage Law Firm. Always wait on the curb, at least 6 feet away from the street, when waiting for school buses at a bus stop. Do not approach a bus until the vehicle has come to a complete stop and a driver has indicated it’s OK to step aboard. Do not stand behind the bus or anywhere a driver cannot see you. In fact, if you cannot see the driver, assume the driver cannot see you – and move to where the driver can see you. When getting off of the bus, be sure to step at least five big steps away from the bus. Be sure to look left, right and then left again before crossing the street. Always pay attention to your surroundings when waiting for, getting on or getting off of a school bus. In other words, put down the distraction so you are aware of what’s going on and can make safe decisions. Look out for children when commuting in the morning in residential areas and/or around schools. Take it slower (about 20 mph) around school zones. Look out for people in crosswalks and always stop when school buses are stopped with flashing red lights. Never pass a stopped school bus, as children may be preparing to cross the street in front of the bus. Put down the distractions and commit to focusing on the road. You never know when you may need to immediately hit the brakes around bus stops or schools, and you need to be prepared to do so. Take direction from school crossing guards if you approach them. Always comply with other traffic laws and be a defensive driver. Do you have other helpful school bus safety tips? If so, share them with us on Facebook & Google+. If you or a loved one has been hurt in bus accident or any type of traffic accident, you can rely on a Portland accident & injury lawyer at the Savage Law Firm for experienced help and aggressive legal advocacy.